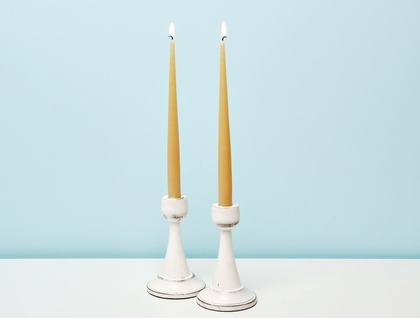 These hand-dipped tapers are made from recycled convent candles. A mix of beeswax and paraffin, the old stubs are melted down, purified, then transformed into gorgeous new candles. 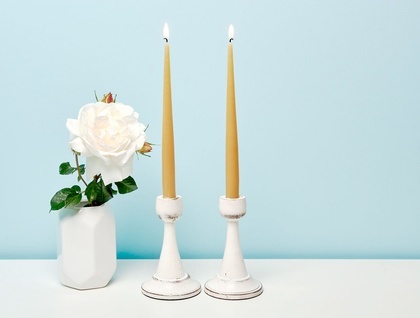 Perfect for the dinner table, or on a side table to create a soft light. Great as a gift, or treat yourself. Approx size 300 x 21mm, comes as set of two joined together – please trim wicks accordingly before lighting. Candle holders and other props not included. Contact roseinthorns to enquire about payment or shipping options.